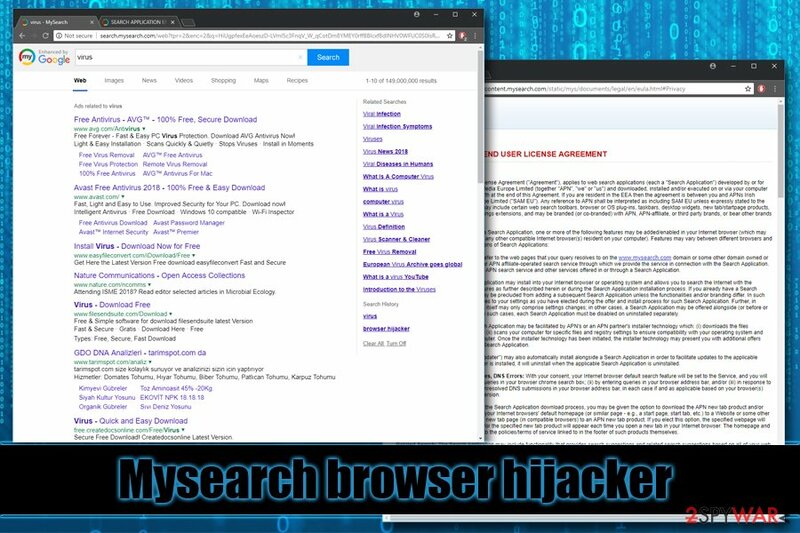 Mysearch is a browser hijacker which stealthily installs on the system together with third-party software. Get rid of this hijacker before it starts redirecting you to phishing sites. Use anti-malware software to make this procedure more accurate. Mysearch is a redirect virus that has been spreading around for several years. It is still actively spreading in Russia, Germany, the US, UK and other world's countries. 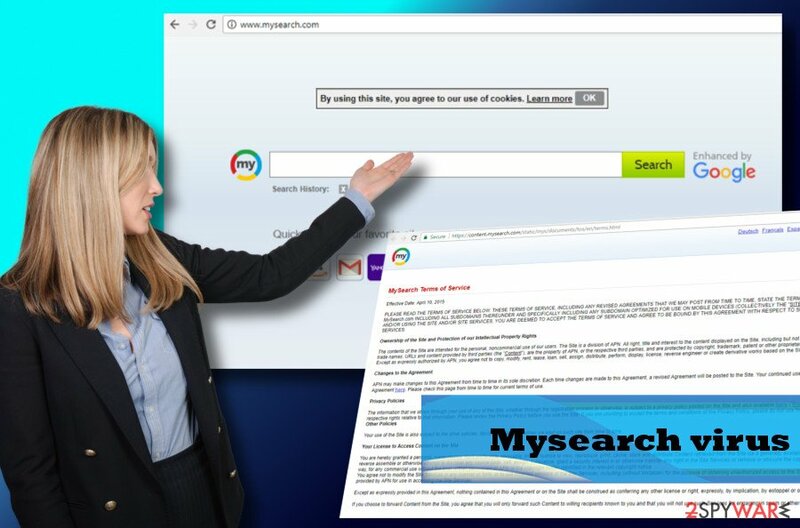 Mysearch is a potentially unwanted program and a browser hijacker developed and published by APN, LLC back in 2014, although the threat is still prevalent today. Although it is introduced as a powerful search engine enhanced by Google, it can hardly be compared with this famous search provider. First of all, the main aim of Mysearch virus is to redirect its visitors to its partners' websites and generate pay-per-click revenue via a hijacked homepage, which is usually set to https://www.my-search.com/?aid=5156&zoneid=89123013. Because of that, most of the hijacker's search results are sponsored and filled with links to third-party sites. 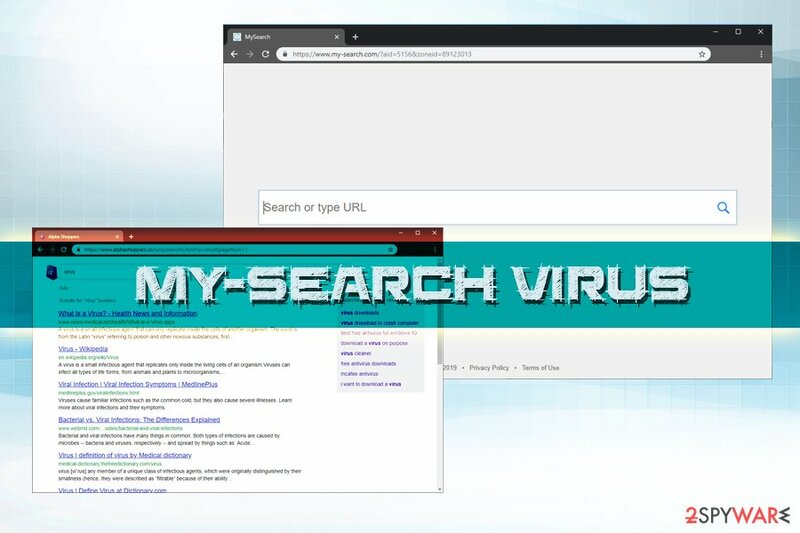 My Search virus can compromise any web browser that is installed on the system, including Google Chrome, Internet Explorer, Mozilla Firefox, Safari, or others. 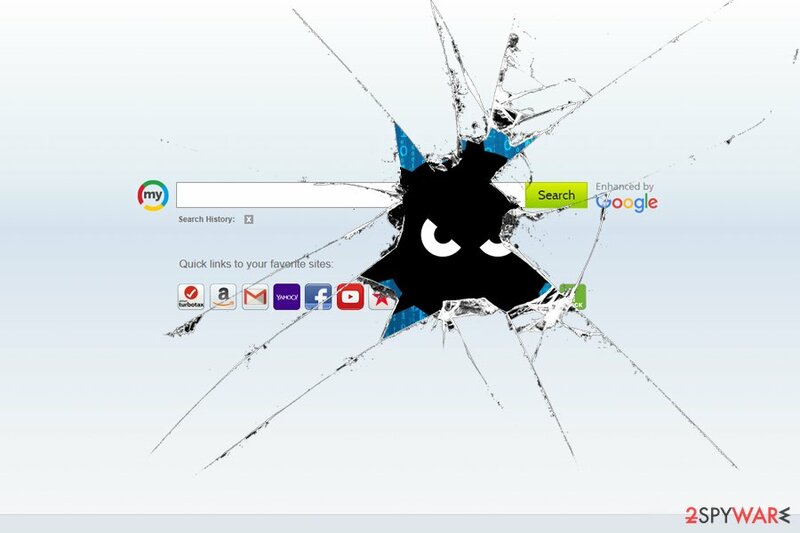 Thus, if you found Mysearch set as your homepage, it is time to take action to protect your online safety. The mysearch virus is not the most dangerous threat circulating on the Internet. However, despite it being positioned among low-danger level cyber infections, do not underestimate its capabilities. Most commonly, the website pops up on the users’ browsers unexpectedly thus hijacking the start page, search provider, and new tab URL without permission. Upon successful set up of Mysearch.com or https://www.my-search.com/?aid=5156&zoneid=89123013 domain, you may notice web browser's slowdowns, freezes, and similar troublesome signs. Rogue software download websites, etc. Nevertheless, the ability to redirect web browsers to irrelevant URLs is not the only trait that Mysearch virus exhibits. Virusi.hr researchers claim that this dubious search engine may also track your browsing on the Internet and collect not only Search Data but also some pieces of personally identifiable information (email address, PC's location or even your name). Although My search virus authors declares that the collected data is not shared with third-parties, you can never be sure about that. A central part of the Site Services includes links to other World Wide Web (“Web“) sites or resources. Because APN has no control over such sites and resources, you acknowledge and agree that APN is not responsible for the availability of such external sites or resources, and does not endorse and is not responsible or liable for any content, advertising, products, or other materials on or available from such sites or resources. By such claims, the developers of Mysearch malware rejects all responsibility for the content that its affiliates may try to promote, be it intrusive or dangerous. Therefore, keep in mind that you're using this search domain at your own risk and there will be no one to be blamed if it initiates redirects to phishing sites and tricks you into downloading malicious programs. Therefore, we would strongly recommend you to download Reimage or other reputable security tool and run a full system scan to remove Mysearch virus completely. The last thing to mention, Mysearch Android version has also been spotted on the wild lately. Some people reported that they'd been redirected to mysearch.com via hxxp://m.web-search.click when visiting random websites on Chrome. Android users should also perform Mysearch removal by scanning the system with Reimage Mobile. As we already mentioned above, My Search virus is referred to as a virus due to its persistence and the fact that is has been terrorizing users for years now. Various versions of the threat have been released into the wild. Please check out the descriptions below in order to check which variant is affecting your device. Additionally, just because the results are redirected to a reputable search engine provider, does not mean they are safe. 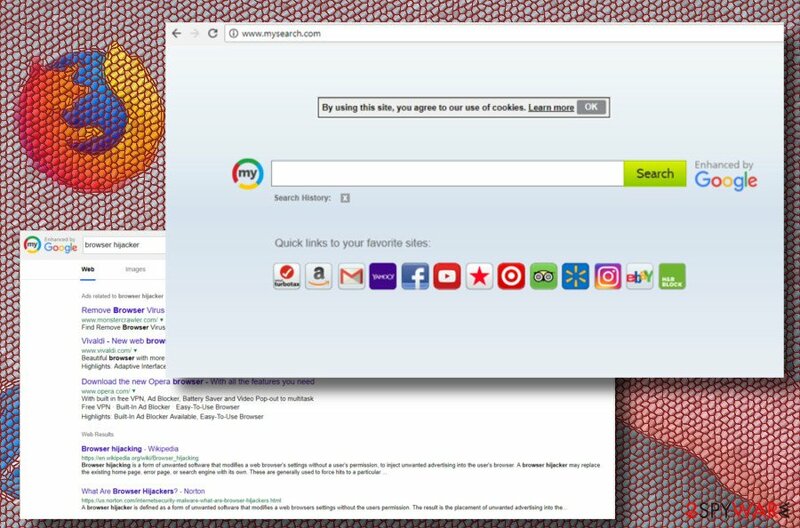 Typically, developers of hijackers like www-mysearch.com add an additional layer of sponsored links at the top, prompting users to visit potentially unsafe websites. Thus, refrain from using this, by first-look, attractive PUP, as it might lead to virus infections or sensitive data leak. Search.mysearch.com is one of the virus variants that populates the typical browser-hijacking homepage. 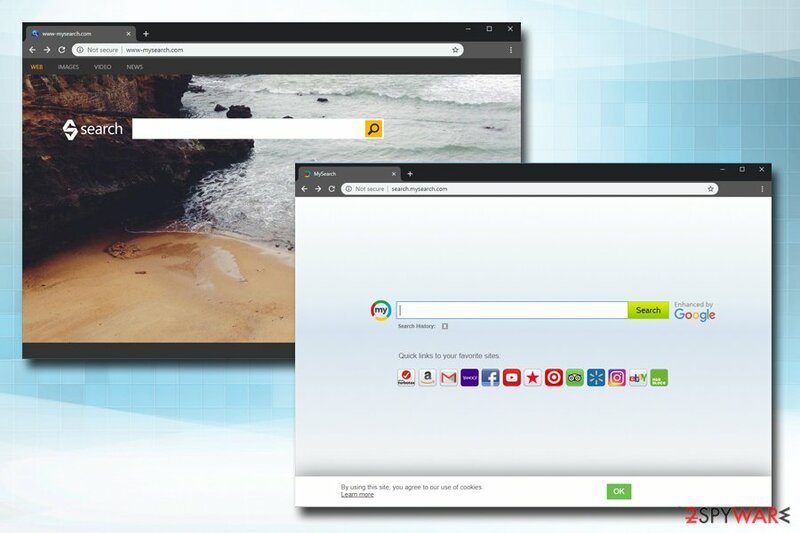 It pretends to be “Enhanced by Google,” although it is obvious that browser hijacker is merely using the industry giant's name in order to make the PUP look more reliable and genuine. However, once Search.mysearch.com unwanted app enters the machine without users noticing, it performs multiple changes to Google Chrome, Safari, Mozilla Firefox or another browser and starts redirecting users to suspicious websites, display sponsored links, add bookmarks without authorization, or even install browser add-ons automatically. Therefore, users are immediately advised to take action and take care of Search.mysearch.com virus removal with the help of security application or by following our guide below. My-search virus is another browser hijacker that is usually bundled with freeware or shareware and gets installed without users noticing. Once the unwanted program is established, victims' homepage is immediately set to hxxps://www.my-search.com/?, although all search results are redirected to Alpha Shoppers. Information collected through the Website may be transferred, used and stored in the United States and in foreign jurisdictions in which we, our users, or our agents for the Website are located now or at any time in the future. If you access the Website, you consent to the capture, storage, transfer, use and processing of your Personal Information (as defined below) in and between all of those jurisdictions. Thus, users who value their privacy and do not want to disclose such data to unknown third-parties should immediately uninstall My-search virus from their computers. Hp.mysearch.com is a potentially unwanted program that modifies the settings of Google Chrome or another browser and sets the homepage and new tab address to hxxp://hp.mysearch.com. From that point of time users are forced to browse through a hijacked search engine. Hp.mysearch.com also ensures that all the search results displayed are fake, i.e., the top results often lead to sponsored or even potentially dangerous websites. Nevertheless, such procedures ensure potentially unwanted program developers the revenue for each click made on such links. Unfortunately, end users might infect their machines with more PUPs, or even malware. Additionally, excessive information tracking and sharing might result in money loss or even identity fraud. Therefore, if you saw that your homepage or/and new tab URL suddenly changed, you should eliminate all potentially unwanted programs from your computer with the help of your removal instructions below. This program is usually spread around using a suspicious distribution method, which is known as “bundling.” This method has become very popular among developers of adware, browser hijackers and similar potentially unwanted programs (PUPs). In most of the cases, the unwanted program is added to other free programs, such as download managers, PDF creators, video streaming software, etc. as optional downloads. However, there's a catch. These attachments are installed by default if the PC's user opts for Quick or Basic installation method. To protect the system from PUP invasion, start checking what programs you download on your computer. Before downloading a new tool, read people's reviews, End User's License Agreement and other details. If you detect nothing suspicious, select Custom or Advanced installation option and monitor the entire installation process carefully to sp;ont and unmark browser add-ons, toolbars or other unwanted attachments. Mysearch.com elimination is not a difficult process. The PUP itself can be uninstalled from the system just like any other application. However, it may have multiple supporting components, such as updater or helper objects. To remove Mysearch virus along with all related components, you should use a professional security tool. Download it and run a scan or make sure to update the one that is currently running on your PC. As soon as you initiate Mysearch removal, you should reset the settings of your web browser. We would highly recommend changing the settings of all browsers, not only the default one. You can find step-by-step instructions on how to eliminate browser hijacker and restore web browser's settings down below. Here, look for Mysearch or any other recently installed suspicious programs. Wait until you see Applications folder and look for Mysearch or any other suspicious programs on it. Now right click on every of such entries and select Move to Trash. When in the new window, check Delete personal settings and select Reset again to complete Mysearch removal. Once these steps are finished, Mysearch should be removed from your Microsoft Edge browser. Here, select Mysearch and other questionable plugins. Click Remove to delete these entries. Now you will see Reset Firefox to its default state message with Reset Firefox button. Click this button for several times and complete Mysearch removal. Here, select Mysearch and other malicious plugins and select trash icon to delete these entries. Click Reset to confirm this action and complete Mysearch removal. Here, select Extensions and look for Mysearch or other suspicious entries. Click on the Uninstall button to get rid each of them. Here, look at the Homepage field. If it was altered by Mysearch, remove unwanted link and enter the one that you want to use for your searches. Remember to include the "http://" before typing in the address of the page. Now you will see a detailed dialog window filled with reset options. All of those options are usually checked, but you can specify which of them you want to reset. Click the Reset button to complete Mysearch removal process. ^ Browser hijacker. Malwarebytes Labs. Blog. ^ Online Surveys: Can You Actually Earn Any Money?. Scam Buster. Internet Scams, Identity Theft, and Urban Legends. ^ Virusi. 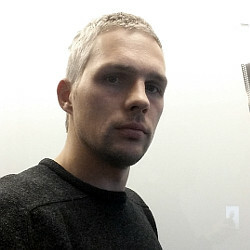 Virusi. Cyber security news, virus database, removal guides. ^ Personally identifiable information (PII). SearchFinancialSecurity. Security-specific information resource . ^ Tim Fisher. What Is Shareware?. Lifewire. Tech Untangled. This entry was posted on 2019-04-01 at 00:06 and is filed under Browser Hijackers, Viruses. You can quickly scan the QR code with your mobile device and have Mysearch virus manual removal instructions right in your pocket. How did you remove Mysearch virus?